Hamak-trak family, which is a Lab-trak project, was designed for Rock’n Coke Festival in 2014 and keeps growing with new functions and missions. We developed hamak-trak family by identifying sitting arrangements made out of nets as ‘hamak’ (hammock). 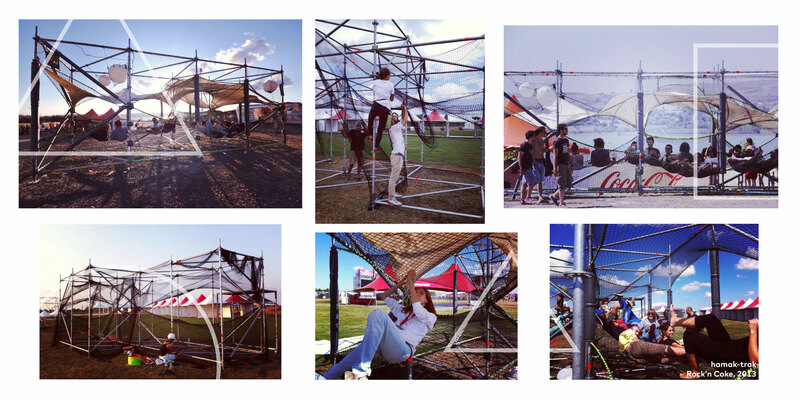 We made these arrangements by stretching the nets in scaffolds, between trees or in specially designed frames. Depending on the structure in which the nets are stretched, hammocks have been used with varying lifetimes ranging from three days to four years. These nets were made of a material called polyamide that is 100% recyclable. If these nets are used for a short time, they are collected and sent for recycling. We think that nets should be used more in the common spaces of the city. 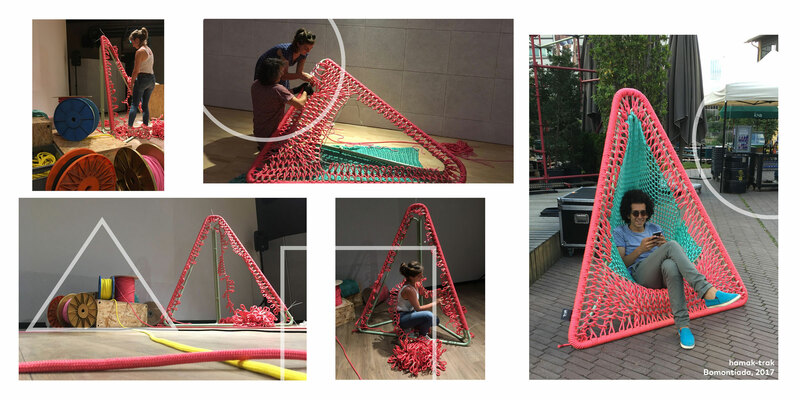 In this respect, we keep working on the material, texture and the form of the nets as a long-term project. Hamak-trak arrangements took place in the following project: Rock’n Coke Festival (2014), Municipality of Kartal, Dragos Archeological Site (2015), Bomontiada: Making Place (2015), One Love Festival (2016), Ergonomics for Who?’ Performance (2017), ‘There Must Be Something’ Workshop (2018). As a part of Lab-trak, we are still working on solutions to make hammocks convenient for indoor use.